Friday night I found myself out on the town looking for something to do, and the Sundown Collaborative Theatre/Audacity Theatre Lab co-production of Brad McEntire’s “Dinosaur and Robot Stop a Train” fit the bill. 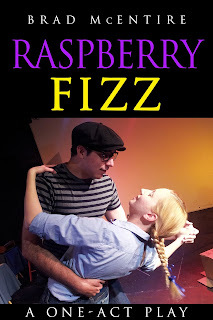 First produced as part of the Dallas’s FIT Festival in 2013, McEntire and Sundown have restaged this delightfully absurd piece of theatre in little d for two weekends before continuing for two more weekends in the historic Margo Jones theatre in Fair Park. I wandered over from the always enjoyable Eastside, past the music pouring from the LSA Burger stage and into the Point Bank Black Box Theatre on Hickory. A simple set graced the space, a folding table, a projector and two small models of what I assumed were the stars of the show. McEntire’s work, which I am fairly familiar with, usually has an air of the whimsical and the nostalgic about it, the pre- show sound design adequately prepared me for the show to come. Snippets of old time radio static interspersed with news bulletins about missing ice cream and a coming news conference let me know what the format of the show was going to be. 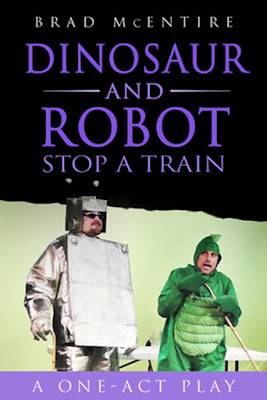 Formatted like a press conference explaining their actions, a Dinosaur and Robot are brought from their respective time periods in an unexplained phenomenon at just the right moment to save a human girl playing on the train tracks near her house. The train is destroyed and the girl is allegedly saved, although she never makes an appearance for reasons that become clear later on. 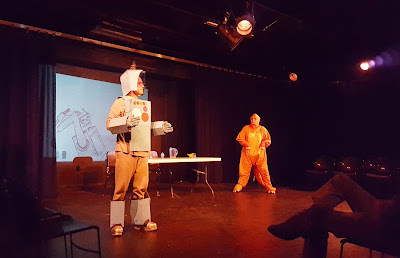 Robot, played by Robert Linder, is the main spokes-robot in the play and he introduces his colleague who appears to be a Tyrannosaur played by Janelle Schroeder. We get the backstories of both characters and then jump to the present/past to hear about the incident referred to in the title of the show. “Dinosaur and Robot Stop a Train” is mostly-family friendly and full of lighthearted jokes, physical humor and even some vaudeville as it can only be performed by a Dinosaur and Robot. Runtime: 1 hr. 5 mins.